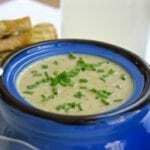 A creamy soup thickened with a roux and potato. Full of flavor and perfect for cold nights. Wash and cut broccoli into florets. Add to crockpot. Measure herbs and add to crockpot. Dice onion and mince garlic. Set aside. Melt butter in a large frying pan over a med to med/high heat. Add onions and sauté for 3 to 4 minutes or until softened. Add garlic and sauté for an additional minute. Add flour and cook for 2 minutes, stirring frequently. After 2 minutes, Slowly whisk in milk, as to not form clumps. Cook until it begins to thicken, about 5 minutes, whisking consistently. Once cooked add to crockpot. Wash, peel and shred potato. Add to crockpot. Add broth to crockpot and stir. Cook on high for 6 hours or on medium for 9 hours. After cooking, use an immersion blender and blend cooked ingredients until thoroughly incorporated. Shred cheeses and add. Cook for an additional 10 minutes or until cheese is melted. Wait until third step to shred potato. If done earlier, it will start to turn pink.